In mathematics, the Borromean rings[a] consist of three topological circles which are linked and form a Brunnian link (i.e., removing any ring results in two unlinked rings). In other words, no two of the three rings are linked with each other as a Hopf link, but nonetheless all three are linked. Although the typical picture of the Borromean rings (above right picture) may lead one to think the link can be formed from geometrically ideal circular rings, they cannot be. Freedman and Skora (1987) prove that a certain class of links, including the Borromean links, cannot be exactly circular. Alternatively, this can be seen from considering the link diagram: if one assumes that circles 1 and 2 touch at their two crossing points, then they either lie in a plane or a sphere. In either case, the third circle must pass through this plane or sphere four times, without lying in it, which is impossible; see (Lindström & Zetterström 1991). It is, however, true that one can use ellipses (right picture). These may be taken to be of arbitrarily small eccentricity; i.e. no matter how close to being circular their shape may be, as long as they are not perfectly circular, they can form Borromean links if suitably positioned; as an example, thin circles made from bendable elastic wire may be used as Borromean rings. Apart from indicating which strand crosses over the other, link diagrams use the same notation to show two strands crossing, as graph diagrams use to show four edges meeting at a common vertex. Accordingly, the graph of the regular octahedron may be converted into a link diagram by prescribing that, as a strand follows successive edges, it alternates between passing over a vertex and passing under the next. The result has three separate loops, linked together as Borromean rings. In knot theory, the Borromean rings are a simple example of a Brunnian link: although each pair of rings is unlinked, the whole link cannot be unlinked. There are a number of ways of seeing this. Simplest is that the fundamental group of the complement of two unlinked circles is the free group on two generators, a and b, by the Seifert–van Kampen theorem, and then the third loop has the class of the commutator, [a, b] = aba−1b−1, as one can see from the link diagram: over one, over the next, back under the first, back under the second. This is non-trivial in the fundamental group, and thus the Borromean rings are linked. Another way is that the cohomology of the complement supports a non-trivial Massey product, which is not the case for the unlink. This is a simple example of the Massey product and further, the algebra corresponds to the geometry: a 3-fold Massey product is a 3-fold product which is only defined if all the 2-fold products vanish, which corresponds to the Borromean rings being pairwise unlinked (2-fold products vanish), but linked overall (3-fold product does not vanish). In arithmetic topology, there is an analogy between knots and prime numbers in which one considers links between primes. The triple of primes (13, 61, 937) are linked modulo 2 (the Rédei symbol is −1) but are pairwise unlinked modulo 2 (the Legendre symbols are all 1). Therefore, these primes have been called a "proper Borromean triple modulo 2" or "mod 2 Borromean primes". The Borromean rings are a hyperbolic link: the complement of the Borromean rings in the 3-sphere admits a complete hyperbolic metric of finite volume. The canonical (Epstein-Penner) polyhedral decomposition of the complement consists of two regular ideal octahedra. The volume is 16Л(π/4) = 7.32772… where Л is the Lobachevsky function. The name "Borromean rings" comes from their use in the coat of arms of the aristocratic Borromeo family in Northern Italy. The link itself is much older and has appeared in the form of the valknut on Norse image stones dating back to the 7th century. The Borromean rings as a symbol of the Christian Trinity, from a 13th-century manuscript. The Borromean rings have been used in different contexts to indicate strength in unity, e.g., in religion or art. In particular, some have used the design to symbolize the Trinity. The psychoanalyst Jacques Lacan famously found inspiration in the Borromean rings as a model for his topology of human subjectivity, with each ring representing a fundamental Lacanian component of reality (the "real", the "imaginary", and the "symbolic"). The rings were used as the logo of Ballantine beer, and are still used by the Ballantine brand beer, now distributed by the current brand owner, the Pabst Brewing Company. The Borromean rings, especially their mathematical properties, were featured by Martin Gardner in his September 1961 "Mathematical Games column" in Scientific American. In 2006, the International Mathematical Union decided at the 25th International Congress of Mathematicians in Madrid, Spain to use a new logo based on the Borromean rings. A stone pillar at Marundeeswarar Temple in Thiruvanmiyur, Chennai, Tamil Nadu, India, has such a figure dating to before 6th century. In medieval and renaissance Europe, a number of visual signs are found that consist of three elements interlaced together in the same way that the Borromean rings are shown interlaced (in their conventional two-dimensional depiction), but the individual elements are not closed loops. Examples of such symbols are the Snoldelev stone horns and the Diana of Poitiers crescents. An example with three distinct elements is the logo of Sport Club Internacional. Less-related visual signs include the Gankyil and the Venn diagram on three sets. Similarly, a monkey's fist knot is essentially a 3-dimensional representation of the Borromean rings, albeit with three layers, in most cases. Using the pattern in the incomplete Borromean rings, one can balance three knives on three supports, such as three bottles or glasses, providing a support in the middle for a fourth bottle or glass. Some knot-theoretic links contain multiple Borromean rings configurations; one five-loop link of this type is used as a symbol in Discordianism, based on a depiction in the Principia Discordia. The standard 3-strand braid corresponds to the Borromean rings. If one cuts the Borromean rings, one obtains one iteration of the standard braid; conversely, if one ties together the ends of (one iteration of) a standard braid, one obtains the Borromean rings. Just as removing one Borromean ring unlinks the remaining two, removing one strand of the standard braid unbraids the other two: they are the basic Brunnian link and Brunnian braid, respectively. In the standard link diagram, the Borromean rings are ordered non-transitively, in a cyclic order. Using the colors above, these are red over green, green over blue, blue over red – and thus after removing any one ring, for the remaining two, one is above the other and they can be unlinked. 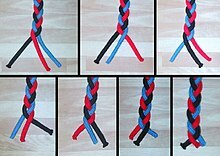 Similarly, in the standard braid, each strand is above one of the others and below the other. Molecular Borromean rings are the molecular counterparts of Borromean rings, which are mechanically-interlocked molecular architectures. In 1997, biologists Chengde Mao and coworkers of New York University succeeded in constructing a set of rings from DNA. In 2003, chemist Fraser Stoddart and coworkers at UCLA utilised coordination chemistry to construct a set of rings in one step from 18 components. Borromean ring structures have been shown to be an effective way to represent the structure of certain atomically precise noble metal clusters which are shielded by a surface layer of thiolate ligands (-SR), such as Au25(SR)18 and Ag25(SR)18. A library of Borromean networks has been synthesized by design by Giuseppe Resnati and coworkers via halogen bond driven self-assembly. A quantum-mechanical analog of Borromean rings is called a halo state or an Efimov state (the existence of such states was predicted by physicist Vitaly Efimov, in 1970). For the first time the research group of Rudolf Grimm and Hanns-Christoph Nägerl from the Institute for Experimental Physics (University of Innsbruck, Austria) experimentally confirmed such a state in an ultracold gas of caesium atoms in 2006, and published their findings in the scientific journal Nature. A team of physicists led by Randall Hulet of Rice University in Houston achieved this with a set of three bound lithium atoms and published their findings in the online journal Science Express. In 2010, a team led by K. Tanaka created an Efimov state within a nucleus. ^ Named after the coat of arms of the Borromeo family in 15th-century Lombardy. ^ N. L. Biggs (1 March 1981). "T. P. Kirkman Mathematician". Bull. London Math. Soc. 13 (2): 116. doi:10.1112/blms/13.2.97. Retrieved 24 January 2017. ^ Arul Lakshminarayan (May 2007). "Borromean Triangles and Prime Knots in an Ancient Temple" (PDF). Indian Academy of Sciences. Retrieved 18 September 2014. ^ a b Kelly S. Chichak; Stuart J. Cantrill; Anthony R. Pease; Sheng-Hsien Chiu; Gareth W. V. Cave; Jerry L. Atwood; J. Fraser Stoddart (28 May 2004). "Molecular Borromean Rings". Science. 304 (5675): 1308–1312. Bibcode:2004Sci...304.1308C. doi:10.1126/science.1096914. PMID 15166376. ^ C. Mao; W. Sun; N. C. Seeman (1997). "Assembly of Borromean rings from DNA". Nature. 386 (6621): 137–138. Bibcode:1997Natur.386..137M. doi:10.1038/386137b0. PMID 9062186. ^ Natarajan, Ganapati; Mathew, Ammu; Negishi, Yuichi; Whetten, Robert L.; Pradeep, Thalappil (2015-12-02). "A Unified Framework for Understanding the Structure and Modifications of Atomically Precise Monolayer Protected Gold Clusters". The Journal of Physical Chemistry C. 119 (49): 27768–27785. doi:10.1021/acs.jpcc.5b08193. ISSN 1932-7447. ^ Vijith Kumar; Tullio Pilati; Giancarlo Terraneo; Franck Meyer; Pierangelo Metrangolo; Giuseppe Resnati (2017). "Halogen bonded Borromean networks by design: topology invariance and metric tuning in a library of multi-component systems". Chemical Science. 8 (3): 1801–1810. doi:10.1039/C6SC04478F. PMC 5477818. PMID 28694953. ^ T. Kraemer; M. Mark; P. Waldburger; J. G. Danzl; C. Chin; B. Engeser; A. D. Lange; K. Pilch; A. Jaakkola; H.-C. Nägerl; R. Grimm (2006). "Evidence for Efimov quantum states in an ultracold gas of caesium atoms". Nature. 440 (7082): 315–318. arXiv:cond-mat/0512394. Bibcode:2006Natur.440..315K. doi:10.1038/nature04626. PMID 16541068. P. R. Cromwell, E. Beltrami and M. Rampichini, "The Borromean Rings", Mathematical Intelligencer Vol. 20 no. 1 (1998) 53–62. Lindström, Bernt; Zetterström, Hans-Olov (1991), "Borromean Circles are Impossible", American Mathematical Monthly, 98 (4): 340–341, doi:10.2307/2323803, JSTOR 2323803 (subscription required). This article explains why Borromean links cannot be exactly circular. Brown, R. and Robinson, J., "Borromean circles", Letter, American Math. Monthly, April, (1992) 376–377. This article shows how Borromean squares exist, and have been made by John Robinson (sculptor), who has also given other forms of this structure. Chernoff, W. W., "Interwoven polygonal frames". (English summary) 15th British Combinatorial Conference (Stirling, 1995). Discrete Math. 167/168 (1997), 197–204. This article gives more general interwoven polygons. Wikimedia Commons has media related to Borromean rings. "Borromean Rings Homepage", Dr Peter Cromwell's website. Jablan, Slavik. "Are Borromean Links So Rare? ", Visual Mathematics. "Borromean rings", The Knot Atlas. "Borromean Rings", The Encyclopedia of Science. "Symbolic Sculpture and the Borromean Rings", Sculpture Maths. "African Borromean ring carving", Sculpture Maths. Hunton, John. "Higher Linkages and Borromean Rings". Numberphile. Brady Haran.